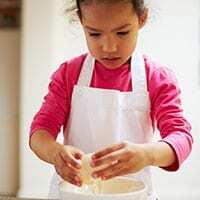 Wondering how to get your kids involved in cooking – here’s a guide to the skills they can learn by age. 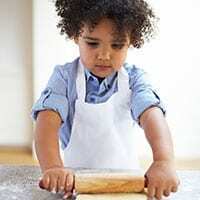 Children will vary in their ability to undertake different cooking activities. Use your own judgment to choose tasks you think are suitable for your child. Safety is the biggest concern, beyond that a little trial and error is all part of the fun. Below we've put together a list of suggested activities for under 3s, 3 – 5 year olds, 5 – 7 years olds, 8 – 11 year olds and children 12 and above. Your little one may not be able to dress himself or go to the toilet on her own but from around 18 months, your child will probably want to start 'helping you out' in the kitchen. Take advantage of their interest to give yourself a break. If they're entertained in the kitchen you can get on with the business of cooking and you'll both be happy. Ensure all hazards are away from grabbing hands – pot handles, hot food and liquids, sharp or heavy utensils and cleaning products. Think about what they can reach or trip over and make sure there is always a clear path if you're carrying anything hot, sharp or heavy. You can set them up on the kitchen table so you know they're at a safe distance. Once you've cleared the way, this is your opportunity to teach your child about food and familiarise them with the kitchen environment. Spooning ingredients into scales – you'll need to help! Another way to keep young children occupied is to give them plastic containers and utensils to wash in the sink – this can provide lengthy entertainment while you cook. In addition to the skills listed for under 3s, 3 – 5 year olds with their increased common sense, ability to follow instructions and dexterity can undertake a wide range of skills. It will depend on your knowledge of your child, as skills can still vary greatly at this age. Many children really don't want to listen to what mummy or daddy say so think safety first and don't try and tackle anything your feel unsure about. Sieving – it's best to balance the sieve over a bowl and tap it rather than shaking it around! Along with the skills suggested for 3-5 year olds, you can now introduce your child to trickier techniques and equipment. At this stage, you could think about buying your child a knife designed for young cooks or using a small adult one. With the introduction of sharp cutting tools like knives and scissors, always consider the ability of your child and if you're not comfortable, then leave it for a while. There are still other more complex skills they can enjoy. If you do think they can manage then still always keep an eye on them as it's very easy to slip even for adults. Along with the skills suggested for 3 – 5 and 5 – 7 year olds, when children reach 8 +, they can start to get involved with planning and undertake activities with a bit more independence. Supervision is still key due to the number of hazards in the kitchen but take a hands off approach where possible. Gradually introduce your children to the above and make sure they are aware of the dangers involved. If you feel they are not ready, hold off for a while. Cuts and burns are common in the kitchen so always keep an eye on them. However capable they may be, it's easy to get distracted or try to rush an activity. 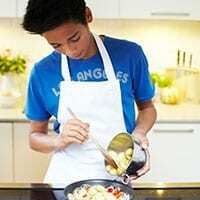 Along with the skills suggested for 5 – 7 and 7 – 11 year olds, when children reach 12 +, they can begin to prepare more complex recipes and even start improvising. How much they can achieve depends on how interested they are in cooking and how much they've done before. Even much older children should have some supervision to avoid accidents in the kitchen. 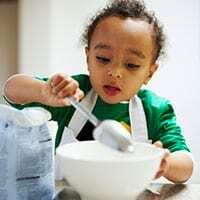 When children learn to look, they will do so by following the recipes carefully with your help. 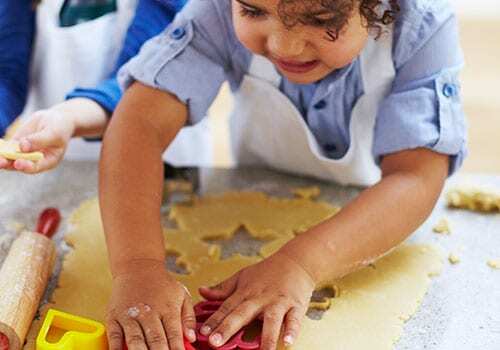 As they become older and more experienced, let them experiment with quantities, although remember that most baking recipes have specific quantities that will not work if changed. Give them opportunities to let their imagination run wild when it comes to presentation of the final dish. Children will learn many things through cooking but the greatest lesson they can learn is to love preparing delicious, healthy, well-rounded meals.